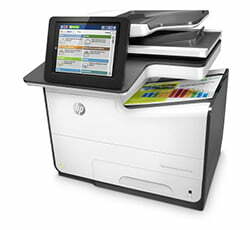 Midshire has recently added HP to its portfolio of printer partner. HP is a multinational IT company that specialises in hardware, software and business services. As an independent HP reseller, Midshire is able to provide and support HP PageWide devices and HP DesignJet large format printers to companies throughout the UK. Midshire is recognised as one of only a handful of HP DesignJet production specialist centres in the UK, receiving Gold Partner status in 2016. This Gold Partner status gives us the highest levels of technical support as well as the best pricing models, which we can in turn pass onto our customers. Midshire can not only supply HP products, but offers service and support on all equipment too. HP is reinventing the way we print, by introducing industry changing HP PageWide technology. These unique printers provide: fast, high quality, low cost, reliable printing. HP PageWide devices have a stationary ‘page wide’ print head which prints using 42,240 tiny nozzles, ejecting ink precisely on a moving sheet of paper. Midshire is one of only a small number of suppliers in the UK to have access to the PageWide range, including the: PageWide 586dn and the PageWide 586z A4 multifunctional printers. Also known as wide format printers or plotters, large format devices are capable of printing on a larger scale than your standard business photocopier. We can recommend the right large format device for your needs. 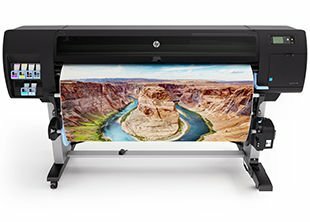 Whether it is it printing GIS files, building plans with scaled line drawings, or graphic posters for ad campaigns, here at Midshire we have a HP large format printer for everyone. Most HP large format printers allow you to print on A1 and A0 size paper width. Many devices are roll fed, so the length of output can run into many metres. You also have the option to print onto many different media types, including photo paper, technical papers and coated papers. As a HP Gold Partner and DesignJet Production Specialist Centre, we are fully accredited to sell and service this range of printers. 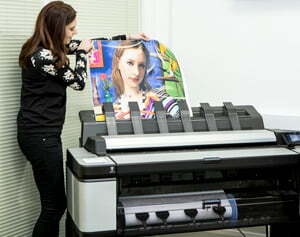 We have the in-house expertise to recommend a large format printer based on your requirements and usage. As well as this, our Midshire engineers are trained to support and maintain the printers in the field. We supply and service HP large format printers and can even provide these on a new ink inclusive contract. An ink inclusive contract is a fully comprehensive service agreement for large format printers, which is billable through the consumption of ink. The costing for this type of contract is determined as a price per millilitre of ink use. There are no additional charges for the hardware, just buy or lease your chosen printer as usual. We take a monthly meter reading from your printer using our OneStop software and bill you for the ink you have used, there are no additional charges for delivery of ink or engineer support.